We started from a marvelous tour around La Boqueria - the most famous food market in Barcelona, where one can buy almost anything. I'll shortly say more about the tour and now let me tell about the class itself, which was one of the strongest impressions I got from our Barcelona trip. When we came back to class the first thing we made was crema catalana - probably the most widely known Spanish dessert either served on its own (with caramel crust) or used as a filling for different kinds of pastry e.g. xuxo (xuixo). The process was in many ways similar to crème anglaise, but had some differences. First volunteers beat the egg yolks with some sugar till they went pale, added a stick of cinnamon, some lemon zest and cold milk. Then the mixture needed to be cooked slowly over low heat, stirring constantly. To help it thicken, in went some starch, dissolved in cold milk. After the first bubble the cream went off the heat and got ladled into the serving dishes to cool down. Then we moved to making appetizers and started from gazpacho shots topped with smoked cheese. We seeded and peeled the tomatoes and blended them together with some vinegar and salt. The ready gazpacho went to the small serving glasses. The topping had three components: Idiazabal smoked cheese, aioli (garlic sauce, one of the key in Catalan cooking) and picada (another basic Catalan sauce made by crushing together some garlic, salt, nuts, parsley and sometimes bread in a mortar). Next thing we made was tortilla de patatas, the famous Spanish potato omelet. I cooked it before, but here I got much better understanding of the right way to do it. Potatoes and onions need to be sliced around 3 mm thick. The cooking is done in plenty of olive oil on medium heat, so the potatoes become soft but do not brown. The onions are added to the pan when the potatoes are half done. Then it is better to take the ready vegetables out of the oil and let them cool. We beat the eggs, seasoned them with salt and mixed them with the potatoes and onions. Now the fun started. The tortilla needs to be fried on both sides and that's the tricky part. Anna made the first one to show how this is possible. She ladled quite a lot of tortilla batter into the hot pan with olive oil. For the first 3-4 minutes she kept stirring the eggs, to get them evenly half-cooked. Then she pressed the batter down with a spatula. To turn the tortilla she covered the pan with a plate and flipped it over. Then she let the tortilla slide back to the pan, now the fried side up. In some 2-3 more minutes the tortilla was done. Alexia and Anna suggested we serve the tortilla on tomato bread. That was the first time I actually watched hot the tomato bread is made. Before that it was hard to imagine how one can "rub" the bread with a tomato. From what I saw in the tapas bars, the bread used for this appetizer can vary a lot. This time we used sour peasant bread and small sized deep red soft tomatoes. Alexia and Anna cut the tomatoes in half and rubbed each piece of bread, gently pressing the tomato cut side down. The flash spread over the bread and the skin got left in their hands. Then they sprinkled the bread with salt and drizzled lightly with olive oil. Now the most important part of the exercise was coming. We were making a large seafood paella and a smaller vegetarian one. The large paella pan was no less than 60 cm in diameter, so it needed a special heating appliance, which Alexia installed over the stove. At first she quickly fried the prawns till they colored, transferred them to a plate and set aside. The important starting step for the paella is to "caramelize" tomatoes. Peeled and chopped tomatoes go to the hot and oiled pan. They need to be cooked over medium heat and stirred constantly till they turn into dark red-brown paste. The garlic also goes in somewhere in the middle of this process. When the tomatoes almost starts to burn, the squid, clams and mussels get stirred in. Then in goes the dry rice. The rice needs to be short-grain. In this sense the risotto rice is not really a good substitute. The sushi rice does better. After a couple minutes of stirring Alexia poured in the fish stock. From this point, the rice should not be touched. No stirring. It is just cooked for 8 minutes on medium-high heat plus 10 minutes on low heat. The prawns go on top some half a minute before the end of the cooking, just to warm up. It is better to let the paella stand for 5 minutes before serving (if that's feasible in your situation). With the vegetable paella we followed the same technology but using some asparagus, bell peppers, peas and leak instead of seafood. Before the class a was always curious where this delicious thin "skin" covering the well cooked paella comes from. Now I observed that it naturally develops throughout the final steaming process and "sets" over the 5 minutes before serving. The last thing we did was caramelizing the crema catalana. I never had a chance to try my hand on a butane torch before. That felt amazing. We sprinkled the cold cream with sugar and caramelized it with the torch. The caramel quickly set and formed fragile crust. Then we decorated the dessert with fresh figs and were finally done. It was over 3 p.m. and we were really hungry. Alexia and Anna put a substantial effort into actually serving the food for us, so we could just sit, relax, drink wine and enjoy the great dinner. As our teachers instructed we mixed the gazpacho with its three toppings before eating. This produced very fresh, colorful and appetizing flavor, which made me even more hungry. That's where the tender tortilla served over the slices of fragrant tomato bread with crunchy crust was so welcome. I couldn't tear myself away from the seafood paella. It's seafood flavor was so intense and full that I couldn't help wondering how we could achieve that. The best paella I had before that was at La Fonda restaurant, but this one impressed me even more. Later I was discussing this with Alexia, trying to understand where the difference was coming from, and she suggested that it might have been the broth. There are different ways to cook it and it has a great role in paella flavor. The vegetable paella was also fine. However the seafood one stays the name of the game for me. 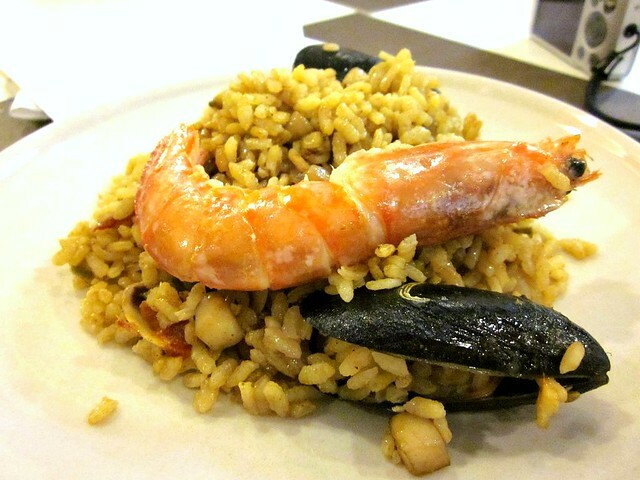 Somehow it just feels that seafood is what the paella should be. Crema catalana tasted quite different to me from the crème brûlée I'm more accustomed to. Lemon and cinnamon changed the impression a lot. Tired, full and happy we left cook&taste with our packs of recipes. It deeply touched me. I wish I could one day become part of a school like this one. My husband and I were delighted with our guide. She was very knowledgeable and passionate about the cultural destinations in Barcelona. We visited the Sagrada Familia, Park Guell, and the Barri Gotic all in one day www.privatetoursinistanbul.com but it never felt overwhelming as she paced us well and took breaks as we needed (what with me being 7 months pregnant!) Her English was excellent and she always took the time to answer any whimsical questions about Catalan language, life, and whatnot that crossed our minds. A must if you want to experience Barcelona in the most in-depth way possible!